Updated in May 2016. Added some great new wood e-cigarettes to the list, and updated the status of a few that aren’t available anymore. With their metal construction, it might be fair to say that e-cigarettes lack a bit of the tactile feel that you’d get from a real cigarette or cigar, which puts your hands in direct contact with the tobacco you’re smoking. Perhaps this is why some e-cigarette companies have taken it upon themselves to create wood e-cigarettes. Wood has proven to be fertile ground for small companies, and these wood e-cigarettes are certain to catch your eye. This lovely wood e-cigarette comes in two colors and uses dual 18650 batteries for operation at up to 160 watts. It also supports temperature control operation and has a nifty screen reversing function. If you happen to be left handed and are tired of constantly looking at a display that’s upside-down, this might be the mod for you. 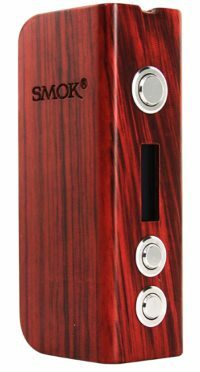 With its Brazilian zebrawood body and stainless steel buttons, the SMOK Treebox appears to have remarkable fit and finish for a mass-produced device. 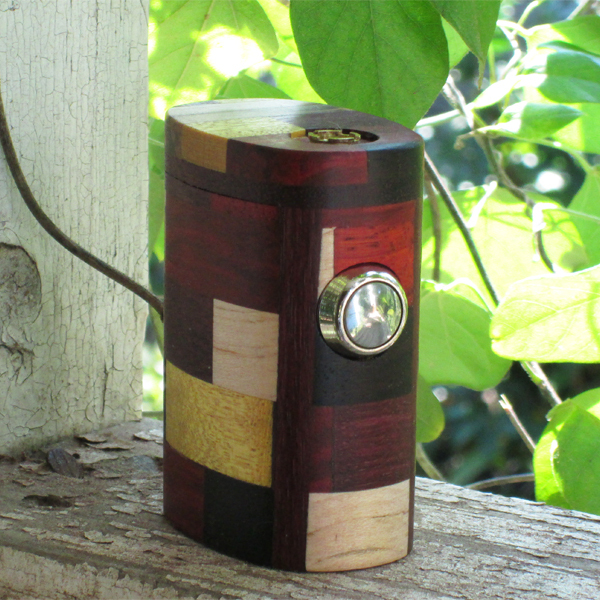 The Treebox uses a single 18650 battery concealed under a magnetic side panel and supports variable-wattage operation up to 75 watts or temperature control operation up to 600 degrees Fahrenheit. It’s also one of the prettiest box mods money can buy. The X-Cube is a box-shaped wood e-cigarette mod that features a 700 mAh battery with magnetic closure, eGo attachment threading and 3.7-volt operation. An LED on the MOD tells you the current charge status of the battery. Otherwise, this mod appears to be purely mechanical — hence the very affordable price. Made by Lewis Gentry, the LG Mod is a catch-all term for a custom-modded wood e-cigarette with a wide variety of different shapes and materials. From the appearance, it looks as though the LG Mod is based on 3.7-volt eGo batteries, and the wood selection looks quite exotic. Unfortunately, the LG Mod is currently unavailable. A post from Lewis Gentry on the product page indicates that a new product is scheduled for release in June or July, but it isn’t immediately clear whether the announcement was made in 2012 or 2013. In 2012, ECF user alekos557 made an offer to the community that resulted in over 1,800 posts before the end of the year. Using his woodworking skill, he offered to construct wood e-cigarette shells for the community at $30 per unit. 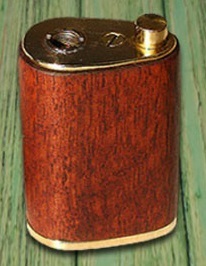 The Wildman Wood Mod was a shaped hollow wood e-cigarette with space for the DIY’er to add his or her own battery, microprocessor, button and attachment threading. 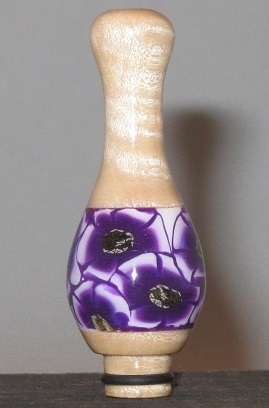 It was made available in a variety of woods and shapes and appears to have been quite a hit. However, alekos557 closed the thread in late 2012; perhaps the effort required was too great was too great for the relatively small profit his mod earned. 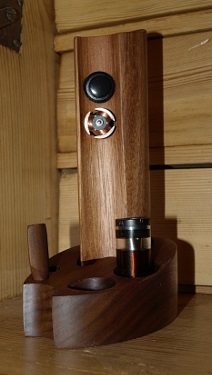 Priced at £70 and up, Touchwood is a range of wood e-cigarettes with a level of worksmanship that I think a lot of other e-cigarette modders would envy. 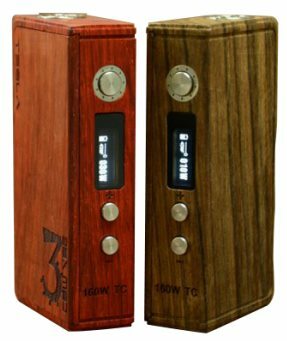 Utilizing lovely reclaimed hardwoods, the Torchwood supports single- or dual-battery operation for a maximum power level of 7.4 volts. Because it is purely a mechanical mod and has no internal electronics, there’s virtually nothing in the Touchwood e-cigarette that could potentially fail on you, with the exception of the fire button. On the other hand, the lack of protective circuitry also means that you could potentially hurt yourself with this mod by doing something such as combining dual batteries with a low-resistance attachment. Here’s hoping that Touchwood will make a mod with protective circuitry soon, so this lovely product can get into the hands of more mainstream e-smokers. 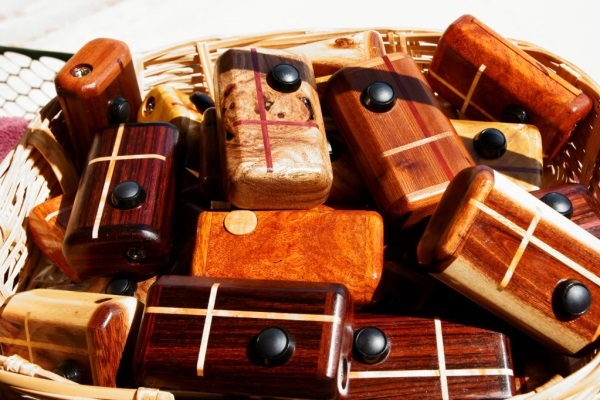 Priced at $45 and up, Ecigworkshop’s beautiful wood e-cigarettes are constructed in a variety of shapes and are available in practically any wood you would imagine. They’ve even constructed beautiful mosaic e-cigarettes from wood tiles in complimentary colors such as the model pictured. This lovely e-cigarette costs $120. Link removed in 2016 as Ecigworkshop appears to be out of business. Although it doesn’t seem to be sold through any online storefront, it appears that ECF forum member fonosmoak still sells his creation through the forum. Production of the Phidias Mod may be slow; there consistently appears to be a waiting list for the device. However, from the pictures it appears to be incredibly beautiful. The Phidias mod supports the Evolv Kick, a little device that converts a single-battery e-cigarette into a variable-wattage device with a maximum power of 10 watts. 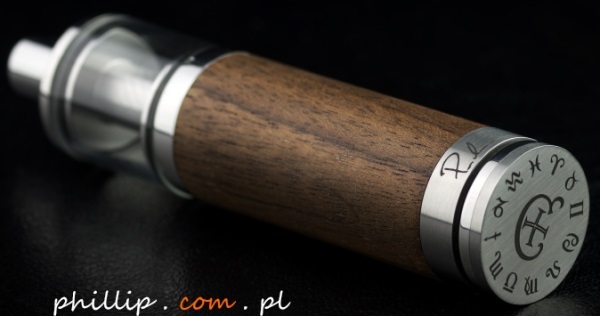 AltSmoke sells the Kick on its own for $44.95; when you consider that plus the worksmanship required to create such a beautiful wood e-cigarette, the $160 price tag of the Phidias seems more than fair. 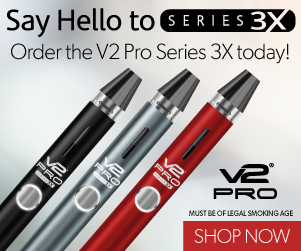 One of the beautiful things about small-scale e-cigarette modding is that it’s a wonderful line of work for people who can’t stand to do the same thing twice. If your product is nice enough, you’ll find people willing to buy it. 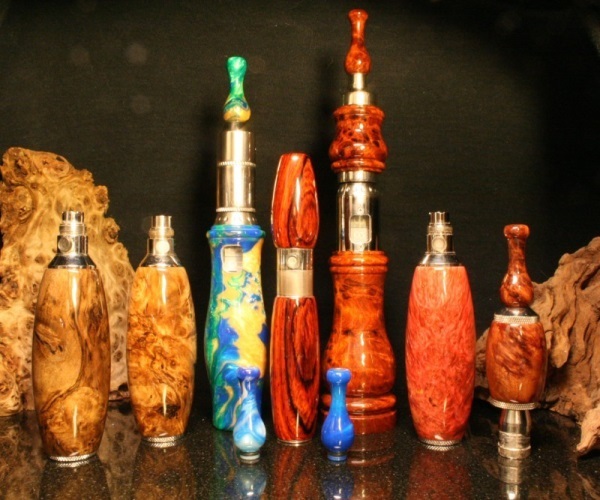 One picture couldn’t possibly do justice to the large variety of designs seen at the VaporWoods website; you simply have to check the gallery out for yourself. To call these things “beautiful” wouldn’t be sufficient; they’re absolute works of art. 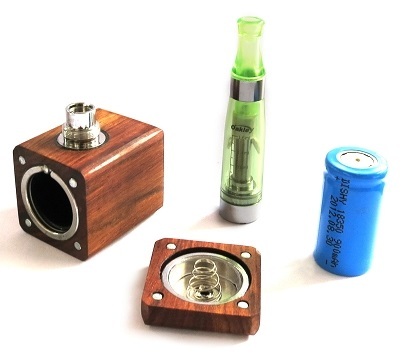 Depending on the particular product, VaporWoods mods may include features such as DNA 12 variable-wattage circuitry, support for the Evolv Kick, and a matching stand. 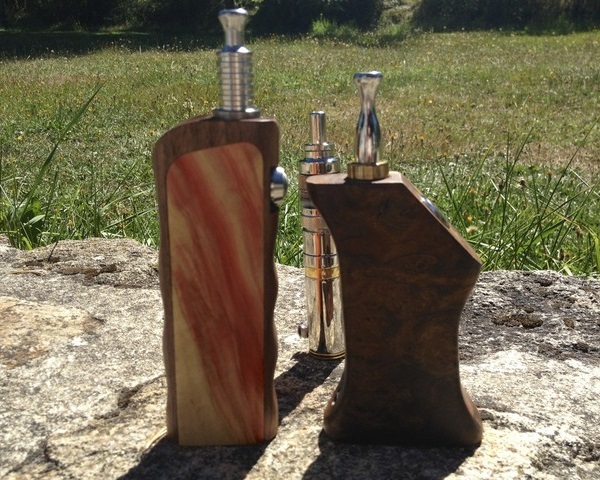 Although VaporWoods’ prices start at $150, they can quickly ramp up to over $200 depending on features and materials. From the pictures, the price looks more than worth it. Link removed in 2015 — website has been taken offline. I’m unable to find much information about Caravela Mods. Although they appear to have an official website, no purchase information seems to be available. 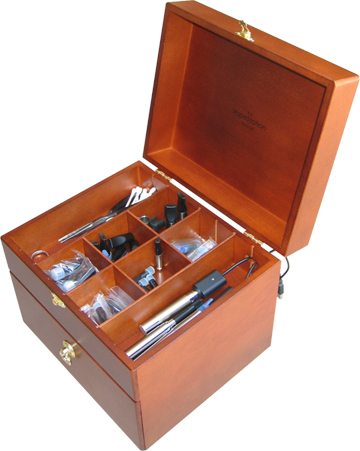 It appears that you have to join the Caravela forum or contact Caravela directly for more information, as the company seems wary of people who want to purchase this beautiful wood e-cigarette simply to flip it on another forum. It’s not immediately apparent what the features of this device are, but it’s gorgeous. Hit the link to see additional pictures of the same mod with brushed and polished metal finishes. If you’re going to buy a wood e-cigarette, why not complement it with a one-of-a-kind wood drip tip? Costing around $25 each, every Molehill Mountain drip tip is a unique piece of art that will never quite be duplicated. Although wood drip tips are a bit fussy compared to metal ones — you can’t let them stay wet or mold could form — I think the beauty of these products would be well worth the effort. Although the drip tip pictured here is my favorite, there’s no way that I could illustrate the wide range of products available from Molehill Mountain with a single picture. You’ll just have to take a look at the website. If you’ve still got a need for wood after buying your wood e-cigarette and wood drip tip, you might want to look at the VapeStation. Constructed from cypress veneer and finished with a walnut stain, the VapeStation appears to be much more than just a repurposed jewelry or watch valet. The tep section has two large dividers appropriate for virtually any type of e-cigarette battery. Each has a cutout for charging cables, allowing you to place the VapeStation next to a computer or power outlet and conceal your e-cigarette batteries tastefully while charging them. The other dividers in the top section are appropriate for smaller items such as extra cartomizers, tanks and drip tips. The bottom section is the perfect height for most e-liquid containers and has sufficient room for about 36 large bottles.